In theoretical physics, quantum field theory (QFT) is a theoretical framework that combines classical field theory, special relativity, and quantum mechanics:xi and is used to construct physical models of subatomic particles (in particle physics) and quasiparticles (in condensed matter physics). QFT treats particles as excited states (also called quanta) of their underlying fields, which are—in a sense—more fundamental than the basic particles. Interactions between particles are described by interaction terms in the Lagrangian involving their corresponding fields. Each interaction can be visually represented by Feynman diagrams, which are formal computational tools, in the process of relativistic perturbation theory. As a successful theoretical framework today, quantum field theory emerged from the work of generations of theoretical physicists spanning much of the 20th century. Its development began in the 1920s with the description of interactions between light and electrons, culminating in the first quantum field theory — quantum electrodynamics. A major theoretical obstacle soon followed with the appearance and persistence of various infinities in perturbative calculations, a problem only resolved in the 1950s with the invention of the renormalization procedure. A second major barrier came with QFT's apparent inability to describe the weak and strong interactions, to the point where some theorists called for the abandonment of the field theoretic approach. The development of gauge theory and the completion of the Standard Model in the 1970s led to a renaissance of quantum field theory. Magnetic field lines visualized using iron filings. When a piece of paper is sprinkled with iron filings and placed above a bar magnet, the filings align according to the direction of the magnetic field, forming arcs. Quantum field theory is the result of the combination of classical field theory, quantum mechanics, and special relativity. :xi A brief overview of these theoretical precursors is in order. Despite the enormous success of classical electromagnetism, it was unable to account for the discrete lines in atomic spectra, nor for the distribution of blackbody radiation in different wavelengths. Max Planck's study of blackbody radiation marked the beginning of quantum mechanics. He treated atoms, which absorb and emit electromagnetic radiation, as tiny oscillators with the crucial property that their energies can only take on a series of discrete, rather than continuous, values. These are known as quantum harmonic oscillators. This process of restricting energies to discrete values is called quantization. :Ch.2 Building on this idea, Albert Einstein proposed in 1905 an explanation for the photoelectric effect, that light is composed of individual packets of energy called photons (the quanta of light). This implied that the electromagnetic radiation, while being waves in the classical electromagnetic field, also exists in the form of particles. In the same year as his paper on the photoelectric effect, Einstein published his theory of special relativity, built on Maxwell's electromagnetism. New rules, called Lorentz transformation, were given for the way time and space coordinates of an event change under changes in the observer's velocity, and the distinction between time and space was blurred. :19 It was proposed that all physical laws must be the same for observers at different velocities, i.e. that physical laws be invariant under Lorentz transformations. Two difficulties remained. Observationally, the Schrödinger equation underlying quantum mechanics could explain the stimulated emission of radiation from atoms, where an electron emits a new photon under the action of an external electromagnetic field, but it was unable to explain spontaneous emission, where an electron spontaneously decreases in energy and emits a photon even without the action of an external electromagnetic field. Theoretically, the Schrödinger equation could not describe photons and was inconsistent with the principles of special relativity — it treats time as an ordinary number while promoting spatial coordinates to linear operators. Robert Oppenheimer showed in 1930 that higher-order perturbative calculations in QED always resulted in infinite quantities, such as the electron self-energy and the vacuum zero-point energy of the electron and photon fields, suggesting that the computational methods at the time could not properly deal with interactions involving photons with extremely high momenta. :25 It was not until 20 years later that a systematic approach to remove such infinities was developed. A series of papers were published between 1934 and 1938 by Ernst Stueckelberg that established a relativistically invariant formulation of QFT. In 1947, Stueckelberg also independently developed a complete renormalization procedure. Unfortunately, such achievements were not understood and recognized by the theoretical community. In 1947, Willis Lamb and Robert Retherford measured the minute difference in the 2S1/2 and 2P1/2 energy levels of the hydrogen atom, also called the Lamb shift. By ignoring the contribution of photons whose energy exceeds the electron mass, Hans Bethe successfully estimated the numerical value of the Lamb shift. :28 Subsequently, Norman Myles Kroll, Lamb, James Bruce French, and Victor Weisskopf again confirmed this value using an approach in which infinities cancelled other infinities to result in finite quantities. However, this method was clumsy and unreliable and could not be generalized to other calculations. The breakthrough eventually came around 1950 when a more robust method for eliminating infinities was developed Julian Schwinger, Feynman, Freeman Dyson, and Shinichiro Tomonaga. The main idea is to replace the initial, so-called "bare", parameters (mass, electric charge, etc. ), which have no physical meaning, by their finite measured values. To cancel the apparently infinite parameters, one has to introduce additional, infinite, "counterterms" into the Lagrangian. This systematic computational procedure is known as renormalization and can be applied to arbitrary order in perturbation theory. By applying the renormalization procedure, calculations were finally made to explain the electron's anomalous magnetic moment (the deviation of the electron g-factor from 2) and vacuum polarisation. These results agreed with experimental measurements to a remarkable degree, thus marking the end of a "war against infinities". 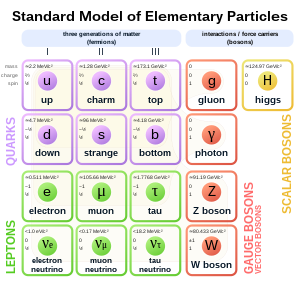 Elementary particles of the Standard Model: six types of matter quarks, four types of gauge bosons that carry fundamental interactions, as well as the Higgs boson, which endow elementary particles with mass. Sheldon Glashow developed a non-Abelian gauge theory that unified the electromagnetic and weak interactions in 1960. In 1964, Abdus Salam and John Clive Ward arrived at the same theory through a different path. This theory, nevertheless, was non-renormalizable. By combining the earlier theory of Glashow, Salam, and Ward with the idea of spontaneous symmetry breaking, Steven Weinberg wrote down in 1967 a theory describing electroweak interactions between all leptons and the effects of the Higgs boson. His theory was at first mostly ignored,:6 until it was brought back to light in 1971 by Gerard 't Hooft's proof that non-Abelian gauge theories are renormalizable. The electroweak theory of Weinberg and Salam was extended from leptons to quarks in 1970 by Glashow, John Iliopoulos, and Luciano Maiani, marking its completion. These theoretical breakthroughs brought about a renaissance in QFT. The full theory, which includes the electroweak theory and chromodynamics, is referred to today as the Standard Model of elementary particles. The Standard Model successfully describes all fundamental interactions except gravity, and its many predictions have been met with remarkable experimental confirmation in subsequent decades. :3 The Higgs boson, central to the mechanism of spontaneous symmetry breaking, was finally detected in 2012 at CERN, marking the complete verification of the existence of all constituents of the Standard Model. Among the four fundamental interactions, gravity remains the only one that lacks a consistent QFT description. Various attempts at a theory of quantum gravity led to the development of string theory,:6 itself a type of two-dimensional QFT with conformal symmetry. Joël Scherk and John Schwarz first proposed in 1974 that string theory could be the quantum theory of gravity. Although quantum field theory arose from the study of interactions between elementary particles, it has been successfully applied to other physical systems, particularly to many-body systems in condensed matter physics. Historically, the Higgs mechanism of spontaneous symmetry breaking was a result of Yoichiro Nambu's application of superconductor theory to elementary particles, while the concept of renormalization came out of the study of second-order phase transitions in matter. Soon after the introduction of photons, Einstein performed the quantization procedure on vibrations in a crystal, leading to the first quasiparticle — phonons. Lev Landau claimed that low-energy excitations in many condensed matter systems could be described in terms of interactions between a set of quasiparticles. The Feynman diagram method of QFT was naturally well suited to the analysis of various phenomena in condensed matter systems. Gauge theory is used to describe the quantization of magnetic flux in superconductors, the resistivity in the quantum Hall effect, as well as the relation between frequency and voltage in the AC Josephson effect. For simplicity, natural units are used in the following sections, in which the reduced Planck constant ħ and the speed of light c are both set to one. A classical field is a function of spatial and time coordinates. Examples include the gravitational field in Newtonian gravity g(x, t) and the electric field E(x, t) and magnetic field B(x, t) in classical electromagnetism. A classical field can be thought of as a numerical quantity assigned to every point in space that changes in time. Hence, it has infinite degrees of freedom. Many phenomena exhibiting quantum mechanical properties cannot be explained by classical fields alone. Phenomena such as the photoelectric effect are best explained by discrete particles (photons), rather than a spatially continuous field. The goal of quantum field theory is to describe various quantum mechanical phenomena using a modified concept of fields. Canonical quantisation and path integrals are two common formulations of QFT. :61 To motivate the fundamentals of QFT, an overview of classical field theory is in order. The quantisation procedure for the above classical field is analogous to the promotion of a classical harmonic oscillator to a quantum harmonic oscillator. where a is a complex number (normalised by convention), and ω is the oscillator's frequency. Note that x is the displacement of a particle in simple harmonic motion from the equilibrium position, which should not be confused with the spatial label x of a field. The preceding procedure is a direct application of non-relativistic quantum mechanics and can be used to quantise (complex) scalar fields, Dirac fields,:52 vector fields (e.g. the electromagnetic field), and even strings. However, creation and annihilation operators are only well defined in the simplest theories that contain no interactions (so-called free theory). In the case of the real scalar field, the existence of these operators was a consequence of the decomposition of solutions of the classical equations of motion into a sum of normal modes. To perform calculations on any realistic interacting theory, perturbation theory would be necessary. , etc. The summation over the index μ has been omitted following the Einstein notation. If the parameter λ is sufficiently small, then the interacting theory described by the above Lagrangian can be considered as a small perturbation from the free theory. In other words, the overall amplitude is the sum over the amplitude of every possible path between the initial and final states, where the amplitude of a path is given by the exponential in the integrand. Now we assume that the theory contains interactions whose Lagrangian terms are a small perturbation from the free theory. Since λ is a small parameter, the exponential function exp can be expanded into a Taylor series in λ and computed term by term. This equation is useful in that it expresses the field operator and ground state in the interacting theory, which are difficult to define, in terms of their counterparts in the free theory, which are well defined. is the Lagrangian density. As in the previous paragraph, the exponential factor involving the interaction term can also be expanded as a series in λ.
Feynman rules can be used to directly evaluate tree-level diagrams. However, naïve computation of loop diagrams such as the one shown above will result in divergent momentum integrals, which seems to imply that almost all terms in the perturbative expansion are infinite. The renormalisation procedure is a systematic process for removing such infinities. Parameters appearing in the Lagrangian, such as the mass m and the coupling constant λ, have no physical meaning — m, λ, and the field strength ϕ are not experimentally measurable quantities and are referred to here as the bare mass, bare coupling constant, and bare field, respectively. The physical mass and coupling constant are measured in some interaction process and are generally different from the bare quantities. While computing physical quantities from this interaction process, one may limit the domain of divergent momentum integrals to be below some momentum cut-off Λ, obtain expressions for the physical quantities, and then take the limit Λ → ∞. This is an example of regularisation, a class of methods to treat divergences in QFT, with Λ being the regulator. Conformal field theories (CFTs) are special QFTs that admit conformal symmetry. They are insensitive to changes in the scale, as all their coupling constants have vanishing β function. (The converse is not true, however — the vanishing of all β functions does not imply conformal symmetry of the theory.) Examples include string theory and N = 4 supersymmetric Yang–Mills theory. The quantisation and renormalisation procedures outlined in the preceding sections are performed for the free theory and ϕ4 theory of the real scalar field. A similar process can be done for other types of fields, including the complex scalar field, the vector field, and the Dirac field, as well as other types of interaction terms, including the electromagnetic interaction and the Yukawa interaction. Shown above is an example of a tree-level Feynman diagram in QED. It describes an electron and a positron annihilating, creating an off-shell photon, and then decaying into a new pair of electron and positron. Time runs from left to right. Arrows pointing forward in time represent the propagation of positrons, while those pointing backward in time represent the propagation of electrons. A wavy line represents the propagation of a photon. Each vertex in QED Feynman diagrams must have an incoming and an outgoing fermion (positron/electron) leg as well as a photon leg. is an element of the U(1) group, thus QED is said to have U(1) gauge symmetry. :496 The photon field Aμ may be referred to as the U(1) gauge boson. The theoretical foundation of general relativity, the equivalence principle, can also be understood as a form of gauge symmetry, making general relativity a gauge theory based on the Lorentz group. Noether's theorem states that every continuous symmetry, i.e. the parameter in the symmetry transformation being continuous rather than discrete, leads to a corresponding conservation law. :17-18:73 For example, the U(1) symmetry of QED implies charge conservation. The Standard Model obeys Poincaré symmetry, whose generators are spacetime translation Pμ and Lorentz transformation Jμν. :58–60 In addition to these generators, supersymmetry in (3+1)-dimensions includes additional generators Qα, called supercharges, which themselves transform as Weyl fermions. :795:444 The symmetry group generated by all these generators is known as the super-Poincaré group. In general there can be more than one set of supersymmetry generators, QαI, I = 1, ..., N, which generate the corresponding N = 1 supersymmetry, N = 2 supersymmetry, and so on. :795:450 Supersymmetry can also be constructed in other dimensions, most notably in (1+1) dimensions for its application in superstring theory. If supersymmetry is promoted to a local symmetry, then the resultant gauge theory is an extension of general relativity called supergravity. The ϕ4 theory, QED, QCD, as well as the whole Standard Model all assume a (3+1)-dimensional Minkowski space (3 spatial and 1 time dimensions) as the background on which the quantum fields are defined. However, QFT a priori imposes no restriction on the number of dimensions nor the geometry of spacetime. In Minkowski space, the flat metric ημν is used to raise and lower spacetime indices in the Lagrangian, e.g. where g = det(gμν), and ∇μ denotes the covariant derivative. The Lagrangian of a QFT, hence its calculational results and physical predictions, depends on the geometry of the spacetime background. Using perturbation theory, the total effect of a small interaction term can be approximated order by order by a series expansion in the number of virtual particles participating in the interaction. Every term in the expansion may be understood as one possible way for (physical) particles to interact with each other via virtual particles, expressed visually using a Feynman diagram. The electromagnetic force between two electrons in QED is represented (to first order in perturbation theory) by the propagation of a virtual photon. In a similar manner, the W and Z bosons carry the weak interaction, while gluons carry the strong interaction. The interpretation of an interaction as a sum of intermediate states involving the exchange of various virtual particles only makes sense in the framework of perturbation theory. In contrast, non-perturbative methods in QFT treat the interacting Lagrangian as a whole without any series expansion. Instead of particles that carry interactions, these methods have spawned such concepts as 't Hooft–Polyakov monopole, domain wall, flux tube, and instanton. In spite of its overwhelming success in particle physics and condensed matter physics, QFT itself lacks a formal mathematical foundation. For example, according to Haag's theorem, there does not exist a well-defined interaction picture for QFT, which implies that perturbation theory of QFT, which underlies the entire Feynman diagram method, is fundamentally not rigorous. Since the 1950s, theoretical physicists and mathematicians have attempted to organise all QFTs into a set of axioms, in order to establish the existence of concrete models of relativistic QFT in a mathematically rigorous way and to study their properties. This line of study is called constructive quantum field theory, a subfield of mathematical physics,:2 which has led to such results as CPT theorem, spin-statistics theorem, and Goldstone's theorem. Compared to ordinary QFT, topological quantum field theory and conformal field theory are better supported mathematically — both can be classified in the framework of representations of cobordisms. Yang-Mills existence and mass gap, one of the Millenium Prize Problems, concerns the well-defined existence of Yang-Mills theories as set out by the above axioms. The full problem statement is as follows. ^ a b c d e f g h i j k l m n o p q r s t u v w x y z aa ab ac ad ae af ag ah ai aj ak al am an ao ap aq ar as at au av aw ax ay az Peskin, M.; Schroeder, D. (1995). An Introduction to Quantum Field Theory. Westview Press. ISBN 978-0-201-50397-5. ^ a b c Hobson, Art (2013). "There are no particles, there are only fields". American Journal of Physics. 81 (211): 211–223. arXiv:1204.4616. Bibcode:2013AmJPh..81..211H. doi:10.1119/1.4789885. ^ a b c d e f g h i j k l m n o p Weinberg, Steven (1977). "The Search for Unity: Notes for a History of Quantum Field Theory". Daedalus. 106 (4): 17–35. JSTOR 20024506. ^ John L. Heilbron (14 February 2003). The Oxford Companion to the History of Modern Science. Oxford University Press. ISBN 978-0-19-974376-6. ^ Joseph John Thomson (1893). Notes on Recent Researches in Electricity and Magnetism: Intended as a Sequel to Professor Clerk-Maxwell's 'Treatise on Electricity and Magnetism'. Dawsons. ^ a b c d e f g h i j k l m Weisskopf, Victor (November 1981). "The development of field theory in the last 50 years". Physics Today. 34 (11): 69–85. Bibcode:1981PhT....34k..69W. doi:10.1063/1.2914365. ^ Werner Heisenberg (1999). Physics and Philosophy: The Revolution in Modern Science. Prometheus Books. ISBN 978-1-57392-694-2. ^ a b c d e f g h i j Shifman, M. (2012). Advanced Topics in Quantum Field Theory. Cambridge University Press. ISBN 978-0-521-19084-8. ^ a b c d 't Hooft, Gerard (2015-03-17). "The Evolution of Quantum Field Theory". The Standard Theory of Particle Physics. Advanced Series on Directions in High Energy Physics. 26. pp. 1–27. arXiv:1503.05007. Bibcode:2016stpp.conf....1T. doi:10.1142/9789814733519_0001. ISBN 978-981-4733-50-2. ^ Yang, C. N.; Mills, R. L. (1954-10-01). "Conservation of Isotopic Spin and Isotopic Gauge Invariance". Physical Review. 96 (1): 191–195. Bibcode:1954PhRv...96..191Y. doi:10.1103/PhysRev.96.191. ^ a b c Coleman, Sidney (1979-12-14). "The 1979 Nobel Prize in Physics". Science. 206 (4424): 1290–1292. Bibcode:1979Sci...206.1290C. doi:10.1126/science.206.4424.1290. JSTOR 1749117. PMID 17799637. ^ Sutton, Christine. "Standard model". britannica.com. Encyclopædia Britannica. Retrieved 2018-08-14. ^ Kibble, Tom W. B. (2014-12-12). "The Standard Model of Particle Physics". arXiv:1412.4094 [physics.hist-ph]. ^ a b c Polchinski, Joseph (2005). String Theory. 1. Cambridge University Press. ISBN 978-0-521-67227-6. ^ Schwarz, John H. (2012-01-04). "The Early History of String Theory and Supersymmetry". arXiv:1201.0981 [physics.hist-ph]. ^ "Common Problems in Condensed Matter and High Energy Physics" (PDF). science.energy.gov. Office of Science, U.S. Department of Energy. 2015-02-02. Retrieved 2018-07-18. ^ a b Wilczek, Frank (2016-04-19). "Particle Physics and Condensed Matter: The Saga Continues". Physica Scripta. 2016 (T168): 014003. arXiv:1604.05669. Bibcode:2016PhST..168a4003W. doi:10.1088/0031-8949/T168/1/014003. ^ a b c d e f g h i j k l m n o p q r s t Zee, A. (2010). Quantum Field Theory in a Nutshell. Princeton University Press. ISBN 978-0-691-01019-9. ^ Fock, V. (1932-03-10). "Konfigurationsraum und zweite Quantelung". Zeitschrift für Physik (in German). 75 (9–10): 622–647. Bibcode:1932ZPhy...75..622F. doi:10.1007/BF01344458. ^ Becker, Katrin; Becker, Melanie; Schwarz, John H. (2007). String Theory and M-Theory. Cambridge University Press. p. 36. ISBN 978-0-521-86069-7. ^ Fujita, Takehisa (2008-02-01). "Physics of Renormalization Group Equation in QED". arXiv:hep-th/0606101. ^ Aharony, Ofer; Gur-Ari, Guy; Klinghoffer, Nizan (2015-05-19). "The Holographic Dictionary for Beta Functions of Multi-trace Coupling Constants". Journal of High Energy Physics. 2015 (5): 31. arXiv:1501.06664v3. Bibcode:2015JHEP...05..031A. doi:10.1007/JHEP05(2015)031. ^ Kovacs, Stefano (1999-08-26). "N = 4 supersymmetric Yang–Mills theory and the AdS/SCFT correspondence". arXiv:hep-th/9908171. ^ Veltman, M. J. G. (1976). Methods in Field Theory, Proceedings of the Les Houches Summer School, Les Houches, France, 1975. ^ Brading, Katherine A. (March 2002). "Which symmetry? Noether, Weyl, and conservation of electric charge". Studies in History and Philosophy of Science Part B: Studies in History and Philosophy of Modern Physics. 33 (1): 3–22. Bibcode:2002SHPMP..33....3B. CiteSeerX 10.1.1.569.106. doi:10.1016/S1355-2198(01)00033-8. ^ Weinberg, Steven (1995). The Quantum Theory of Fields. Cambridge University Press. ISBN 978-0-521-55001-7. ^ de Wit, Bernard; Louis, Jan (1998-02-18). "Supersymmetry and Dualities in various dimensions". arXiv:hep-th/9801132. ^ Polchinski, Joseph (2005). String Theory. 2. Cambridge University Press. ISBN 978-0-521-67228-3. ^ Munoz, Carlos (2017-01-18). "Models of Supersymmetry for Dark Matter". European Physical Journal Web of Conferences. 136: 01002. arXiv:1701.05259. Bibcode:2017EPJWC.13601002M. doi:10.1051/epjconf/201713601002. ^ Morandi, G.; Sodano, P.; Tagliacozzo, A.; Tognetti, V. (2000). Field Theories for Low-Dimensional Condensed Matter Systems. Springer. ISBN 978-3-662-04273-1. ^ Parker, Leonard E.; Toms, David J. (2009). Quantum Field Theory in Curved Spacetime. Cambridge University Press. p. 43. ISBN 978-0-521-87787-9. ^ Ivancevic, Vladimir G.; Ivancevic, Tijana T. (2008-12-11). "Undergraduate Lecture Notes in Topological Quantum Field Theory". arXiv:0810.0344v5 [math-th]. ^ Carqueville, Nils; Runkel, Ingo (2017-05-16). "Physics of Renormalization Group Equation in QED". arXiv:1705.05734 [math.QA]. ^ Haag, Rudolf (1955). "On Quantum Field Theories" (PDF). Dan Mat Fys Medd. 29 (12). ^ a b Buchholz, Detlev (2000). "Current Trends in Axiomatic Quantum Field Theory". Quantum Field Theory. 558: 43–64. arXiv:hep-th/9811233v2. Bibcode:2000LNP...558...43B. ^ a b c Summers, Stephen J. (2016-03-31). "A Perspective on Constructive Quantum Field Theory". arXiv:1203.3991v2 [math-ph]. ^ Sati, Hisham; Schreiber, Urs (2012-01-06). "Survey of mathematical foundations of QFT and perturbative string theory". arXiv:1109.0955v2 [math-ph]. ^ Jaffe, Arthur; Witten, Edward. "Quantum Yang-Mills Theory" (PDF). Clay Mathematics Institute. Retrieved 2018-07-18. Pais, A. (1994) . Inward Bound: Of Matter and Forces in the Physical World (reprint ed.). Oxford, New York, Toronto: Oxford University Press. ISBN 978-0198519973. Schweber, S. S. (1994). QED and the Men Who Made It: Dyson, Feynman, Schwinger, and Tomonaga. Princeton University Press. ISBN 9780691033273. Feynman, R.P. (2001) . The Character of Physical Law. MIT Press. ISBN 978-0-262-56003-0. Feynman, R.P. (2006) . QED: The Strange Theory of Light and Matter. Princeton University Press. ISBN 978-0-691-12575-6. Gribbin, J. (1998). Q is for Quantum: Particle Physics from A to Z. Weidenfeld & Nicolson. ISBN 978-0-297-81752-9. McMahon, D. (2008). Quantum Field Theory. McGraw-Hill. ISBN 978-0-07-154382-8. Bogolyubov, N.; Shirkov, D. (1982). Quantum Fields. Benjamin Cummings. ISBN 978-0-8053-0983-6. Frampton, P.H. (2000). Gauge Field Theories. Frontiers in Physics (2nd ed.). Wiley. Greiner, W.; Müller, B. (2000). Gauge Theory of Weak Interactions. Springer. ISBN 978-3-540-67672-0. Itzykson, C.; Zuber, J.-B. (1980). Quantum Field Theory. McGraw-Hill. ISBN 978-0-07-032071-0. Kane, G.L. (1987). Modern Elementary Particle Physics. Perseus Group. ISBN 978-0-201-11749-3. Kleinert, H.; Schulte-Frohlinde, Verena (2001). Critical Properties of φ4-Theories. World Scientific. ISBN 978-981-02-4658-7. Kleinert, H. (2008). Multivalued Fields in Condensed Matter, Electrodynamics, and Gravitation (PDF). World Scientific. ISBN 978-981-279-170-2. Loudon, R (1983). The Quantum Theory of Light. Oxford University Press. ISBN 978-0-19-851155-7. Mandl, F.; Shaw, G. (1993). Quantum Field Theory. John Wiley & Sons. ISBN 978-0-471-94186-6. Ryder, L.H. (1985). Quantum Field Theory. Cambridge University Press. ISBN 978-0-521-33859-2. Schwartz, M.D. (2014). Quantum Field Theory and the Standard Model. Cambridge University Press. ISBN 978-1107034730. Ynduráin, F.J. (1996). Relativistic Quantum Mechanics and Introduction to Field Theory. Relativistic Quantum Mechanics and Introduction to Field Theory (1st ed.). Springer. Bibcode:1996rqmi.book.....Y. ISBN 978-3-540-60453-2. Greiner, W.; Reinhardt, J. (1996). Field Quantization. Springer. ISBN 978-3-540-59179-5. Peskin, M.; Schroeder, D. (1995). An Introduction to Quantum Field Theory. Westview Press. ISBN 978-0-201-50397-5. Scharf, Günter (2014) . Finite Quantum Electrodynamics: The Causal Approach (third ed.). Dover Publications. ISBN 978-0486492735. Srednicki, M. (2007). Quantum Field Theory. Cambridge University Press. ISBN 978-0521-8644-97. Tong, David (2015). "Lectures on Quantum Field Theory". Retrieved 2016-02-09. Zee, Anthony (2010). Quantum Field Theory in a Nutshell (2nd ed.). Princeton University Press. ISBN 978-0691140346. Brown, Lowell S. (1994). Quantum Field Theory. Cambridge University Press. ISBN 978-0-521-46946-3. Bogoliubov, N.; Logunov, A.A.; Oksak, A.I. ; Todorov, I.T. (1990). General Principles of Quantum Field Theory. Kluwer Academic Publishers. ISBN 978-0-7923-0540-8. Weinberg, S. (1995). The Quantum Theory of Fields. 1. Cambridge University Press. ISBN 978-0521550017.